Hello Zippservian's. Now that you have zeroed in on your property. Set your eyes on the prey, now what's the next step? DRIVE A BARGAIN! Get the best deal possible. But the question remains how? Obviously, everyone wants to pay the lowest amount possible, but the dear builders have the agenda to squeeze the most out of your pocket. With their flashy marketing offices, their fancy terms and their act of being your closest buddy, their main agenda is to close the sale at the best possible profit margin. They make you feel special and as though they have specially cooked up a deal for you and only you! You have to realize no builder will go out of the way and reduce their price for you, it becomes your duty to get them to do that and keep them grounded. This not only applies to builders but also in instances of resale properties too! The way you get them to do that is research, first know your facts rights! Having a good knowledge about the locality, their water supply situation and the present average square feet value in the property and properties around them. If you know your facts, you can call their bluff. On Zippserv Price point you will be able to find the latest transactions in the particular property! Use this information as leverage and push your bargain. Also, when you attack a prey, its better to be in bigger numbers! United we stand divided we fall! The concept of this lays with the greed of the builders to capitalize on bulk closures. If a group of people approached the builder with a minimum of 5 or above bookings, you would be able to drive a harder bargain. The more the merrier! The sheer chance to convert multiple closures makes the builders vulnerable to give you a better discount if a group offers bulk unit bookings. The volume will strengthen the bargain by itself. Also speaking to right people will ensure a better bargain, a rookie sales person will not have the access to offer or hand a better discount for you. Speak to someone higher up on the ladder and show you are serious buyer to access the best. 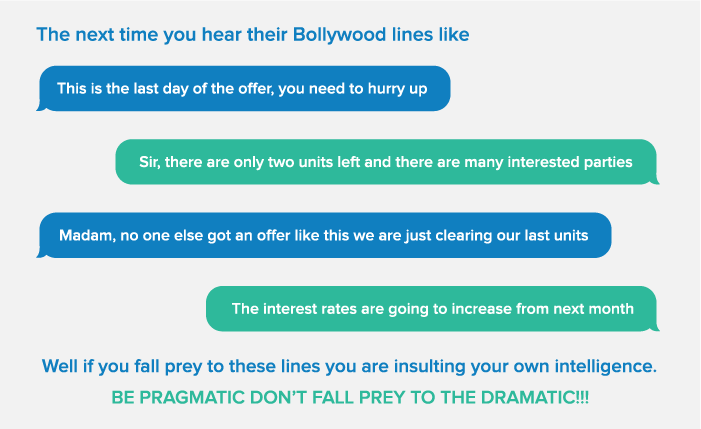 Also, negotiation is not just restricted to price! Choosing an apartment unit that has the best view, maybe pool facing apartments or negotiating to knock of the floor rise charges all fall in the prospect of negotiation. Making sure you get an east facing house or seeking an apartment near the elevator incase you have aged people in the family all comes down to negotiating. Always a group buy is the best as you have more leverage. At Zippserv we also have made provisions so like-minded buyers can come register for group buys and get a better discount from the builder. In numbers we speak, the best bargain we seek!.